Il team Studio 397 ci aggiorna sullo sviluppo in corso delle novità a cui sta lavorando duramente per migliorare ed ottimizzare rFactor2. Gli sviluppatori ci raccontano dei miglioramenti apportati dall'utilizzo delle DirectX 11, l'implementazione del supporto alla VR, i nuovi menu di gioco ed il prossimo arrivo delle nuove vetture Radical. Insomma, c'è davvero tanta carne al fuoco per dare ad un titolo che, ricordiamolo, dispone della fisica più ottimizzata, complessa e realistica del mercato, il lustro che merita. "Spring is in the air and we’re pleased with our progress over the past few months. We have a lot to share with you. We decided to take the time to really bring together all of the newly developed elements – UI, VR, and DX11. Although this puts us slightly behind our targeted “end of Q1” release date, we promise you it will be worth the wait. In addition, we wanted to make sure that modders and leagues have enough time to update their content so it shines in the new engine. With all of this in mind, we’re targeting a release date of May 1st. Over the course of the last month we have spent a lot of time to further optimise the HDR rendering pipeline. We also started adding post processing effects. This is a bit of a balancing act between ensuring we stay compatible with existing content and adding various improvements to the graphical output. Work on shaders, the shadow system, and on various other effects is also under way. Working on the DX11 integration has allowed us to fix some things that were previously unaddressed or needed improvement. For example, we fixed an issue with stray coloured pixels in the distance, caused by MSAA artifacts. We also improved the way shadows are cast on the ground. Shadows now follow the normal maps of the materials, which means for example that the shadow on asphalt follows all the little bumps in the road. Our clouds are using much higher resolution textures, and we fine tuned ambient lighting in overcast conditions by adjusting both the color and intensity of the light. Last month we already showed you improvements, some of which were very subtle. This month, we have a few new screenshots that will show we’re on the right track! Great news! We are already driving in VR – seeing a virtual sun rise through the trees is an incredible experience! Our VR implementation is based on OpenVR. We chose OpenVR for its support of both headsets – the HTC Vive and the Oculus Rift – ensuring future compatibility. To complete the experience, we are integrating VR with the new UI and adjusting several other parts of the game, such as external cameras. The UI is really taking shape. The initial release will be functionally equivalent to the current user interface, but with some advanced features. Each month, features and functionality of the user interface will be improved. For example, the ability to create your own championships and easier ways to create your own hosted environments. 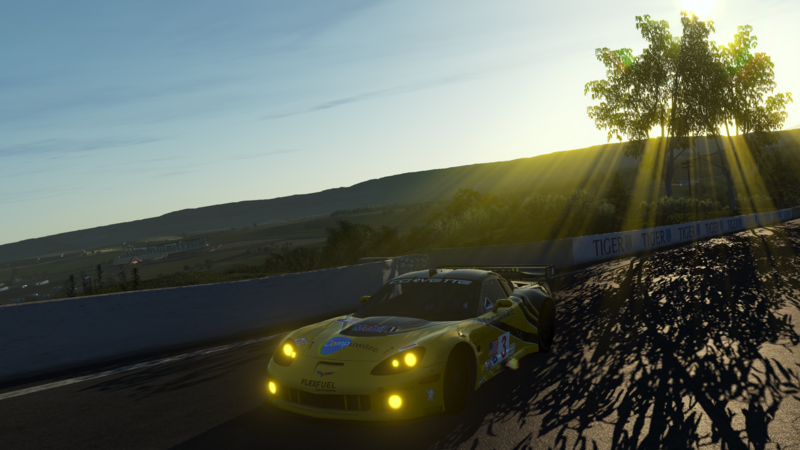 We can’t wait to announce some very, very cool content news soon, for both cars and tracks. As you know, our ambition is to streamline content, aligning cars and tracks. 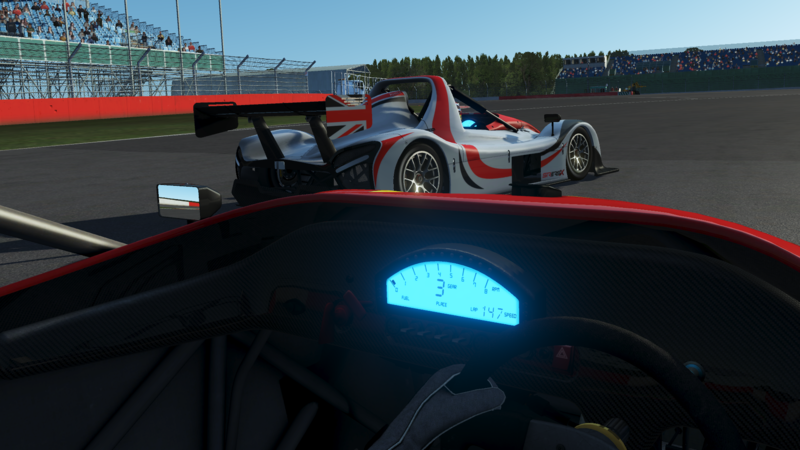 In the meantime, the Radical SR3 is coming along nicely. We have extensive technical data from Radical and are creating the most realistic version that has ever been produced. We are very happy that many modding teams have already applied to join our special forum. We have already started to share information there about upgrading custom shaders. Over the next couple of weeks we will proceed with guidelines on materials and textures as well as provide early beta builds for you to check your work. These guides will be part of a new documentation that we will publish and maintain going forward. So, if you are working on new or existing mods for rFactor 2 and have not done so yet, contact Christopher and Marcel to join the dedicated DX11 forum. That wraps up another monthly roadmap update. We hope you are as excited as we are about what the future will bring!"